We have had some very unpleasant weather this winter. It’s not that it’s been bitterly cold or there’ve been great dumps of snow. It is the warm weather that brings us freezing rain and ice pellets then freezing to a huge coat of ice on everything-your vehicle, your front step, your sidewalk. Today school buses are cancelled, walking outside is treacherous and if you are able, you might want to stay in your pyjamas until it’s time to go to bed tonight. Out I went this morning, ice chipper and shovel in hand. I gave it a good go for over an hour and made some headway. I shoved the crud onto our street. On days like this, it’s wonderful to find happiness in unusual places. 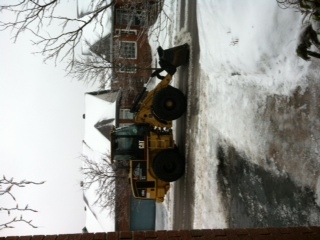 Like the snow plow that shows up AFTER you have pushed the snow onto the street! This is almost as good as winning a lottery. In my case, this is good for smiles at least till dinner time. Every once in a while I come upon something that makes me scratch my head. This observation is about Sudoku puzzles. Wikipedia tells us the term Sudoku is not be confused with Sodoku, a bacterial zoonotic disease. Who knew? I guess this is helpful to know if you take your chimpanzee to the local vet-you wouldn’t want to say, “I think she has a Sudoku” lest you become a laughing-stock. As you probably know you solve the puzzle by inserting the number 1-9 into each line. The same goes for each square-numbers 1 through 9. There is only one solution for each puzzle. People who do Sudoku puzzles usually have a certain method for solving the puzzle, a specific logic. I was given a book about how to solve Sudoku. It was helpful except for the directions for the most difficult puzzles-the explanation was most difficult too. I do puzzles-mostly crossword puzzles. It makes sense to provide the solutions to crossword puzzles. You may have inserted an incorrect word, mis-spelled a word or you don’t know the answer at all. 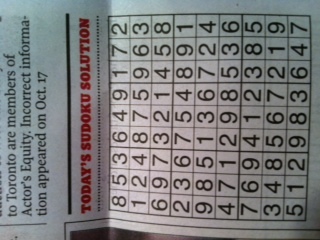 Why in the world do we need the solutions to Sudoku. There is only one answer-either you get it or you don’t. Seeing the solution doesn’t help. You don’t say “Oh, that’s where the three goes!”. It’s a waste of newsprint. Someone told me recently that not all Sudoku puzzles can be answered by logic. There are some where you must guess. That can’t be true, can it? 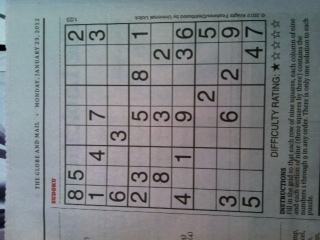 Do you see a need for providing Sudoku solutions? Do you think some Sudoku puzzles can not be solved by logic? The author and her colleagues suggest a number of way to improve your level of happiness. Examples included counting your blessings…but not too often for it then becomes more of a routine must-do effort rather than a practice to increase your level of happiness. With all due respect to Dr. Lyubomirsky and her colleagues, they missed one everyday occurrence that can impact your happiness-at least it does for me. And that occurrence is shopping for dairy products. 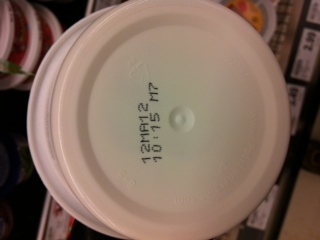 The shopping by itself isn’t that exciting but what can bring me joy is looking at the expiry dates. Here’s an example from the store today. Picture this-it’s January 10th-the wind is blowing, the snow is falling and you are tired of putting on jackets, toques, gloves and boots every time you step outside. Then you are in the dairy section of your local grocer and being the wise shopper you check best-before dates as you shop. 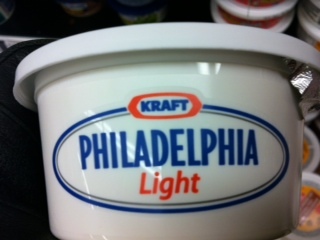 How great is it to see that the cream cheese is telling you spring is around the corner!! May 12th can’t be that far off if the cheese is guaranteed to be of good quality till then. By then we will have small plants ready to go in the garden, we will be itching to start planting seeds, a few games of golf will be under our belts and the bicycle will be serviced and ready to go! No need to point out to me though that expiry dates can conspire against happiness and good moods depending on the season. If you buy dairy products on a beautiful late fall day and expiry date is January-well, you get my (snow) drift. January 4, 2012 by barbstruestories, posted in Beyond full time work, Interesting things..who would have known? Happy New Year one and all! Time to pull out the pants with the elasticized waist bands and to consider the purchase of an elliptical trainer or a long-term gym membership. WordPress sent me an “annual report” for the past year…well it’s actually 3/4 of a year since the first blog was March 31st. The report follows. Thank you for reading the blog. I really appreciate comments on the blog-some come via the comment section and some come direct to me as email. It seems this year people were particularly interested in the retirement blogs and the matching of scotch and chocolate. I won’t be able to repeat the retirement from an almost 40 year career in 2012 while another go at the scotch and chocolate thing is much more likely. A New York City subway train holds 1,200 people. This blog was viewed about 5,600 times in 2011. If it were a NYC subway train, it would take about 5 trips to carry that many people.